Cloud Peak Energy installed the first set of synthetic fibre main boom pendants on its Marion 8200 dragline two years ago – with numerous benefits demonstrating a compelling ROI. The first system recently completed the second annual inspection and shows that it is on track to far outpace the life of steel wire in this rigorous application. With both an increase in production and substantial reduction in boom cracking, Cloud Peak Energy has since converted two additional draglines to Applied Fiber Pendants. The main pendants support the massive boom and loading bucket on a common bottleneck for surface mining operations. The conversion from steel wire pendants to synthetic fibre pendants has provided numerous financial and operational benefits – attributed to the dramatic weight advantage and dampening characteristics of synthetic fibre. Applied Fiber’s synthetic main boom pendants are made with Dyneema® DM20 fibre which is seven times stronger than steel wire rope at the same weight, providing exceptional dampening to system movement. 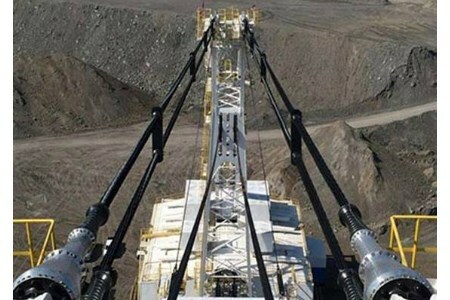 The highly analysed and engineered offering nearly mutes normal pendant and boom bouncing, addressing many historical issues with dragline boom fatigue on a critical US$100 million production asset, while at the same time increasing output potential. “This is not just a change of material, from steel wire to synthetic rope; these pendants are a productivity tool and have provided advantages from day one. They have increased capacity of the dragline, reduced the stresses on the overall system and are providing numerous operational and financial returns that were not expected,” says Jim Pumphrey, VP Industrial Products, Applied Fiber. Cloud Peak has wasted no time taking advantage of the benefits as it has recently outfitted two more draglines in its fleet with fibre main pendants making a total of three (two Marion 8200 and one Bucyrus 1570) draglines. In fact, it retired a set of steel pendants two years early to realise the gains generated from Applied Fiber pendants. Applied Fiber manufactures the fibre pendants from a specialised production facility, integrating the termination/end-fitting technology with a world class production testing process to ensure the pendant ropes are perfectly matched in length and tension to carry out this high load, high cycle application. The one of a kind test bed is 183 m (600 ft) long and has capability to tension and pre-stress pendants to nearly 950 t, (2 million lb.) tension in advance of shipment.